"Roughly 55,000 new small businesses start each month." "Small business owners work an average of 52 hours a week." 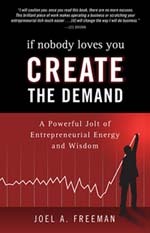 Dr. Freeman's latest book is endorsed by Steve Forbes, Ken Blanchard, Les Brown, Brian Tracy, Ben Carson, Cathy Hughes and many others. along with the technical tools and skills for greater entrepreneurial success. 1. Each participant has a better understanding of his or her entrepreneurial style. 3. Higher morale and greater productivity in marketing. 4. Better listening, creativity and entrepreneurial skills. 5. Greater sensitivity to client diversity. 6. Tools for influencing an emotionally safe climate in the entrepreneurial process. 8. Knowing how to approach different people and situations in an entrepreneurial pursuit. 11.What works and what doesn't work in term of motivation. Work hard. Work smart. 12.Dealing more effectively with a downturn in the economy. Reinvention skills. 13.Creative skills for developing a brand, building on it and protecting it. N o B u l l. N o H y p e.
One of the main objectives of this program is to help each participant identify the arenas he or she has responsibility for or control over in the entrepreneurial process. We spend 75% of the time understanding each individual internal world, getting a better understanding of strengths and vulnerabilities. 25% of the time is then spent looking outward, understanding the way each participant interacts with the people around them. © Copyright, 2007 The Freeman Institute. All rights reserved. Nothing on this page may be used without explicit written permission. * Participants share the best part(s) and most challenging aspect(s) of their jobs (if smaller group). * Humorous concepts illustrating the reality that people are different; predictably different. * The differences between power and influence in the entrepreneurial process. * Johari Window -- How trust and mutual respect are built up or broken down in an organization. * How personal Blind Spots and Mask effect leadership/ followership styles and teamwork. * Who's covering your Blind Spot? * Time for feedback, personal responses to the accuracy of the information, and specific questions.